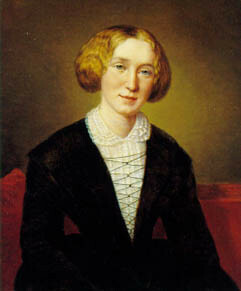 George Eliot (Marian or Mary Ann Evans) was a leading novelist of the Victorian era, whose writings reflect her humanist outlook. She wrote nine full-length novels, including Adam Bede (1859), The Mill on the Floss (1860), Silas Marner (1861) and Middlemarch (1872), as well as short stories and poems. Eliot was born in South Farm, Nuneaton where she lived for four months before the family moved to nearby Griff House. Eliot was baptised (as Mary Ann Evans) at Chilvers Coton Church, Nuneaton. Brought up in the Anglican tradition, Eliot also had early contact with the dissenting churches, which was later to influence both her religious thought and writing. After her contact with the radical group of thinkers known as the Rosehill circle, she found it increasingly difficult to accept Christian doctrine and stopped attending church in 1842, at the age of 22. Amongst her first literary works (and the only to be published under her real name) were translations of David Strauss’s The Life of Jesus (1846), which questioned the divine nature of Jesus, and Feuerbach’s The Essence of Christianity (1854), where god was famously described as nothing more than a projection of the values of man. Eliot was strongly influenced by Feuerbach’s thought and, while she rejected the formal aspects of Christianity, she continued to view god as a projection of an ideal to which humans could aspire, holding on to ideas of Christian morality, especially in her literary attempts to inspire human sympathy and understanding. Her long-term relationship with the already married George Henry Lewes saw Eliot become even more distanced from the religion of her upbringing and its social prescriptions. The thoughts of Dorothea Brooke, the heroine of Middlemarch, on her religious outlook perhaps best sums up Eliot’s own, very individual, position on faith: “Please not to call it by any name…You will say it is Persian, or something else geographical. It is my life. I have found it out, and cannot part with it. I have always been finding out my religion since I was a little girl.’ (Middlemarch, chapter 39). Eliot is buried in Highgate Cemetery East, London and is remembered with a memorial garden and obelisk and a statue, both in Nuneaton and a memorial stone in Westminster Abbey. Nuneaton Museum and Art Gallery contains displays about Eliot including a reconstruction of her drawing room in London and Nuneaton library has the largest public collection of George Eliot material in the country. Arbury Hall – home of the Newdegate family for whom Eliot’s father was a land agent. Used as a basis for Cheveral Manor in Scenes of Clerical Life. Parish Church of St Nicholas. Appeared in Janet’s Repentance and was the scene of many plots.